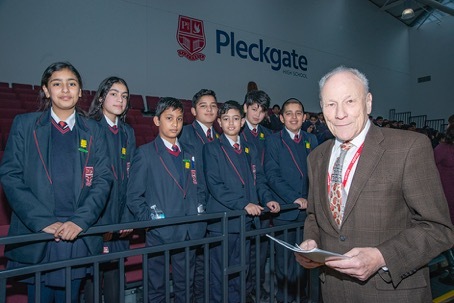 Year Nine students were rapt as they listened to a testimony from Holocaust survivor Tomi Komoly as part of a visit organised by the Holocaust Educational Trust (HET). Tomi, who was a jew in Hungary and is now 82, talked about his experiences during the Second World War and after the Nazi invasion. He talked of the roar of German tanks coming up the street in Budapest in 1944 when he was seven years old and how he became a refugee, and was welcomed with open arms in Austria in the 1950s before going to university in Glasgow and working as an engineer in ICI for 30 years. Head of RE Ms Savage said: “It was a privilege for us to welcome Tomi to our school and his testimony will remain a powerful reminder of the horrors so many experienced. The testimony was followed by a question and answer session to enable students to better understand the nature of the Holocaust and to explore its lessons in more depth.